We were unable to get our Just another Friday at ABG Capital post out last week, but today we have some great updates for you. I first want to report on our office build-out that is moving along nicely. Our “fish bowl” like conference room is almost complete and has already been in use. Our Communications Specialist, Natalie DeCario, was signed up for a 3-day Social Media Boot Camp sponsored by ASPE-ROI. Since they were unable to host the course at their facility, due to a low enrollment, we held it in the new conference room so it wouldn’t get canceled. Our visitors enjoyed the new space! Speaking of social media, we want to give a shout out to Natalie on her first podcast. It revolved around “Social Media Tips and Faux Pas.” She was interviewed by Suzanne Bowen who is blogger for TMCNet on their Monetizing IP Communications channel. We have to give a huge congratulations to our portfolio company, VoIP Innovations, for their recent achievements. They were named 13th overall in the Pittsburgh Business Times 100 Fastest Growing Companies. In their technology category, they ranked number 1! What a great accomplishment everyone, it’s well deserved! Follow these links to see photos from the event along with a video of Jason Tapolci, President of VoIP Innovations, who talks about the company’s success. Not only did they receive that accolade, but they were also notified last week that they ranked 1207 in the Inc. 500/5000 Fastest Growing Company list. This is the second year in a row that VoIP Innovations has ranked in both of these lists. Again, we congratulate everyone at VoIP Innovations for their hard work! Lastly, we want to give you some updates from our month end company meeting that was held today. 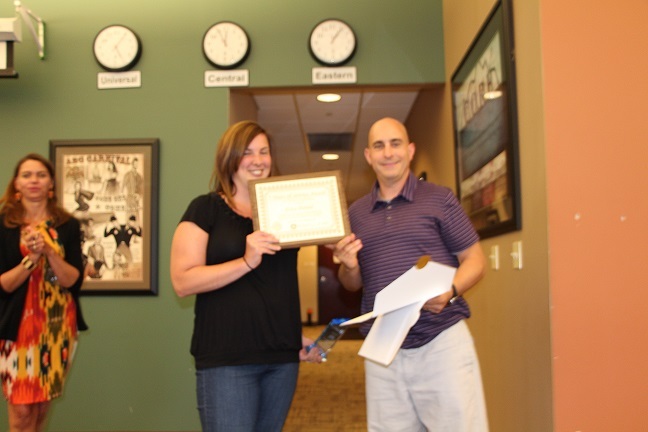 Paul Frye was nominated as the ABG Capital Employees of the Month for July. We also want to recognize Dustin Campbell and Jake Crisman who were our Honorable mentions for July. Keep up the great work, you guys rock! As we wrap up this week’s Just another Friday post, we want to tell everyone to have a fantastic weekend celebrating Labor Day! Since June is coming to an end, we had our Month End Meeting today. Unfortunately our Employee of the Month, Randy Stegner, wasn’t in the office to accept his award but we’ll make sure he gets in on Monday! We also named Matt Chapman as our Honorable Mention. 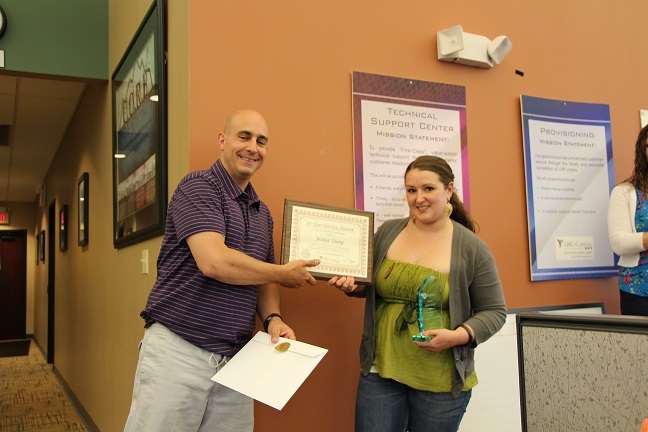 We also congratulated Erica Penrod and Jessica Young for making it to important anniversaries at ABG Capital. Erica has been with us for 5 years and Jessica has been with us for 10 years. Earlier this week we had a big birthday in the office. Rich James, our legal counsel, celebrated his 50th birthday! After work he was surprised with a birthday party at the O’Reilly Theater. Everyone enjoyed a pasta bar and the show, Other Desert Cities. Later in the week Jeff Tapolci and Ron Eggert joined Pete Ferraro from KFMR at the Cigar Bar at Cioppino of Pittsburgh. In the office this week our IT crew, Steve Korbett and Jake Crisman, kept themselves very busy. They always have numerous issues to solve on a daily basis, but this week they’ve ramped up their IT efforts and completed over 22 tasks! Keep up the great work you guys! 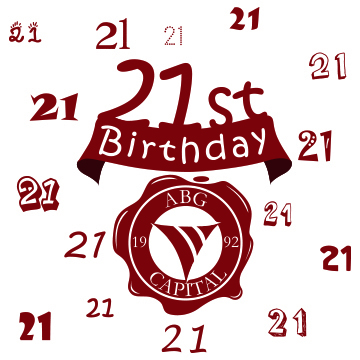 On Sunday, June 23rd, we celebrated our 21st birthday. We’ve grown as an organization so much since 1992 and we love where we are today but our history is still a vital part of our existence. Next week we’ll be posting a more in-depth article on our history and how our values then still hold true today. ABG Capital, a privately held business management company that provides back office services to its portfolio companies, had a stellar 3rd quarter and is on pace to have a record year for 2012. “With the close of the 3rd quarter, all four of ABG Capital’s portfolio companies have contributed to one our best quarters ever. Revenues are up 13% and profits are up 25% from the 1st quarter,” stated Jeff Tapolci, CEO of ABG Capital. VoIP Innovations, ABG Capital’s largest investment, is a wholesale provider of Voice-over-IP telephone services. This company is well on its way to achieving its goal of being the industry’s largest wholesale provider of North American origination and termination. GlobalPOPs, the industry’s largest aggregator of dial-up internet services, continues to actively acquire wholesale dial traffic, as well as end-users through its End User Services (EUS) nameplate. Though the world of dial-up interest service is consistently shrinking, GlobalPOPs and EUS are positioning themselves to be in the dial-up internet market for years. With the fourth quarter being consumed by the election and holiday seasons, having three great quarters completed this year gives ABG Capital the momentum needed to successfully move through the rest of the year. Closing out 2012 in the way that they anticipate will allow them to start 2013 ahead of plan, which will make their shareholders happy. If 2013 is anything like what we saw in 2012, look out. About ABG Capital: Located in Pittsburgh, PA, ABG Capital leverages its unique business management model to reduce costs through the consolidation of back office operations for its portfolio companies. By consolidating services like accounting, legal, IT, software development, employee administration and HR, we are able to eliminate redundancy among, increase efficiency and be very nimble to the changes that occur in the market. 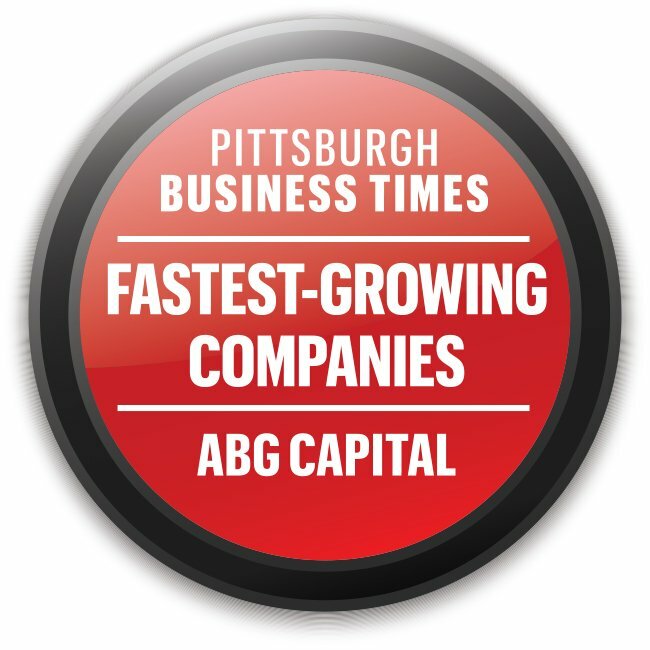 ABG Capital was recently ranked 41st on the Pittsburgh Business Times list of 2012 Best Places to Work in Western Pennsylvania. This list ranks 96 Pittsburgh-area workplaces. Since 2005, ABG Capital has been honored for this recognition six times. “We make a point to foster a family atmosphere here, and to know our employees feel the same way is extremely gratifying,” stated Jeff Tapolci, CEO of ABG Capital. ABG Capital prides itself on creating a positive work culture for its employees. To ensure success, the company abides by their mission, which is to cultivate ideas and people through C.O.R.E. (Cultivate, Overcome, Respect, and Evolve) Values for the purpose of giving back. Additionally, the ABG Capital staff participate in many team activities to help keep employees engaged. The basis of ABG Capital’s mission statement is their C.O.R.E. Values. To Cultivate, they encourage and support a healthy life balance for each employee. They Overcome obstacles by combining passion and perseverance to achieve success. They believe that Respect is achieved by earning mutual trust and exhibiting reliability. They encourage each employee to Evolve by embracing the ability to adapt and innovate. Additionally, ABG Capital values giving back to their community. Every quarter, they have an opportunity to donate time to a community service activity. This past May, they spent an afternoon at the National Cemetery of the Alleghenies, where they cleaned headstones of the entire grounds. Next month, the staff will volunteer their time at the Greater Pittsburgh Community Food Bank. Lastly, ABG Capital believes in keeping morale high and enhancing a team environment by featuring a variety of activities. Some of their favorite opportunities to gather as a group include their annual softball and flag football games. Last Friday, they celebrated their recognition of being one of the region’s best places to work by hosting a wine and cheese event for all employees to partake in.